The Cyber Knights, Middle Georgia State University's cyber defense competition squad, is one of only eight teams to advance to the regional level of the annual Southeast Regional Cyber Defense Competition. At recent state level competition, 33 colleges and universities competed. Regional competition - "the playoffs," so to speak - will take place April 5-6 at Kennesaw State University. Besides Middle Georgia State, playoff teams are Kennesaw State, Lipscomb University, Mercer University, University of Central Florida, University of Florida, University of North Carolina-Wilmington and the University of South Alabama. Cyber defense competitions are staged like real businesses. Teams face a variety of hypothetical situations where students must work together to protect networks against cyber threats and highly skilled hackers from around the world. 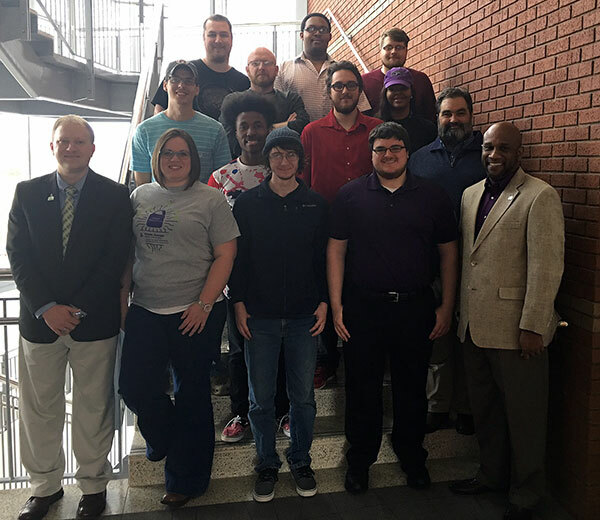 The winner of the regional competition will represent the Southeast at the National Collegiate Cyber Defense Competition in San Antonio, Texas, scheduled for April 13-15. Besides Kirk, team members are Daniel Foreman, Cody Lee, Sean Kessinger, Erin Lucas, Eric Davis, Bryan Cosby, Tyler Rasmussen, Andrew Woodard, Desmond Ashley, Zachary Standridge and Torres Stewart. Middle Georgia State's team is coached by IT faculty members Nelbert St. Clair and Dr. Shannon Beasley.